Taxes are not included 3,00 Euro per person for night. A small kitchen would make this place perfect! 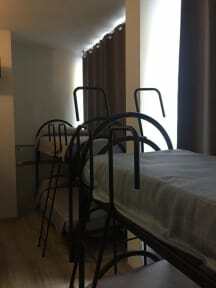 It is a very cheap hostel and for what you pay I can’t complain at all. It was great. No problems and everything was smooth. Good location and comfy clean rooms. Bathroom toilet was broken. No place to fill bottles except in bathroom which wasn’t big enough. Left bag for the day to be kept in “lockers” which was really a free spot in the lounge. Have to pay for the coffee and tea facilities. Staff were nice except the man working reception spoke very little English. Expensive for what it is : the bedrom itself is ok (the locker with the key is included, which is nice) but the bathroom is a bit dirty and unfortunatelly, the personnal doesn't not speak english very well. Also it can be a bit noisy at night. Far away from the city center but close to the central station and subway. This hostel is a place to sleep, but that's about it. It's small, with essentially no communal area (couldn't even find a fork or fridge), and the only people there seem to be staff or people who are living there. The staff isn't particularly friendly and it felt like there wasn't a place to escape the weird vibes. One of the live-in guys was watching TV in our room past 2am and then the radio in the morning. The hostel can't control that, but it's a good example of the energy there. It wasn't clean and the atmosphere was not what you would expect in a hostel, the staff was not friendly. It is close to the train station Milano Centrale, and that makes it convenient if you need to travel the following day. The historic city centre, duomo and the castle are far from there. DONT STAY IN THIS PLACE! Made my booking 3 weeks before my arrival and, however, when I arrived to the hostel there wasnt a place for me. With a really rude staff, they wanted me share a bed with a STRAGER. No words about my terrible experience in this place. I would NEVER recommend this hostel to anybody. Ps: at first, they didnt want to give my money back! I arrived at 2 pm. They started speaking in Italian and not talking to me. Then a guy told me to come with him. He took me to another hostel. While the staff in the other hostel were nice, the room was dirty and I didnt feel safe and so I left the hostel and went to another one. Waste of money, do not go there! Very bad hostel, the worst hostel i have ever been too since my abroad traveling, security is so bad,the stuff is so bad i couldn’t feel safe with my girlfriend, there was one guy from the stuff that was sleeping with us in the room he enters the room at anytime while we are sleeping doing noisy moves switch on the lights, used our bathroom saying some shity words in Italian , room was not locked so it was accessible to anyone, i recommende hardly for everyone to not go with this one..!!! !